Pennies on the Dollar: Is Coal Ready for a Comeback? Four cheap coal stocks -- are they diamonds in the rough? 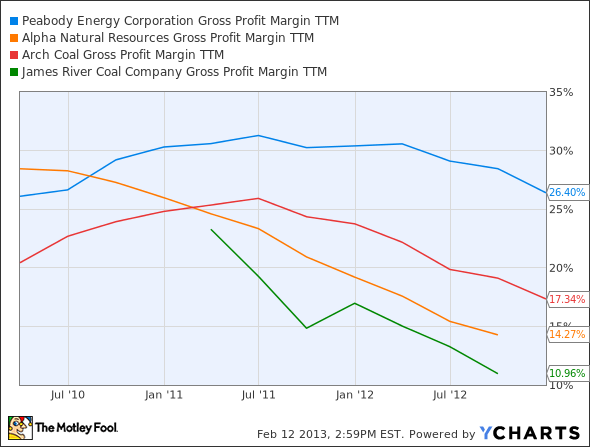 Coal stocks are cheap, and rightly so. A global economic recession, cheap natural gas, and a hostile political environment have seemingly turned coal into a second-rate energy source. But cheap companies can be a value grab -- or turn out to be completely worthless. Let's take a look at four coal stocks -- three trading for pennies on the dollar and one slightly more expensive -- to see if we can find a diamond in the rough. Famed investor Benjamin Graham said, "It is an almost unbelievable fact that Wall Street never asks, 'How much is the business selling for?' Yet this should be the first question in considering a stock purchase." Mr. Graham's simple question has many answers, and investors have worked hard to develop different ways to place a price tag on a company's worth. Ben's favorite: tangible book value. This simple metric takes all the estimated value out of a company and leaves us with something akin to a company's price if it were to be liquidated tomorrow. Intangible assets like brand power or business relationships are gone, giving investors a realistic number for a company's bird-in-hand worth. "Pennies on the dollar" isn't cliche when looking at our first three coal candidates. Alpha Natural Resources (NASDAQOTH:ANRZQ), Arch Coal (NASDAQOTH:ACIIQ), and James River Coal (NASDAQOTH:JRCCQ) are all trading for less than half their tangible book value. James River slumped below the 1:1 mark in late 2011, and Alpha and Arch fell beneath last February. 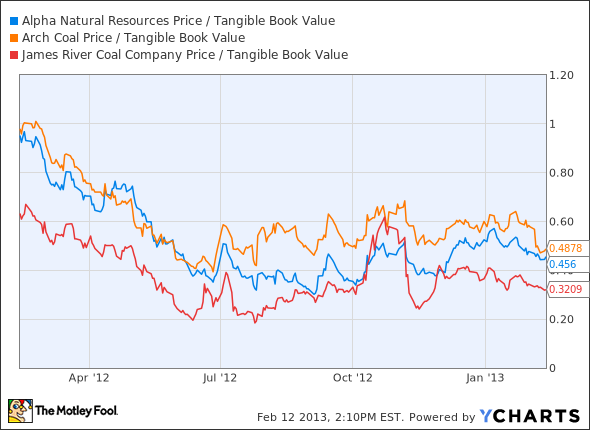 ANR Price / Tangible Book Value data by YCharts. But coal candidate No. 4 offers a more expensive option: Peabody Energy (NYSE:BTU), the largest coal company around, is trading at 1.3 times its tangible book value. The company dipped briefly below during the dog days of summer but has historically maintained a higher valuation than its competitors. 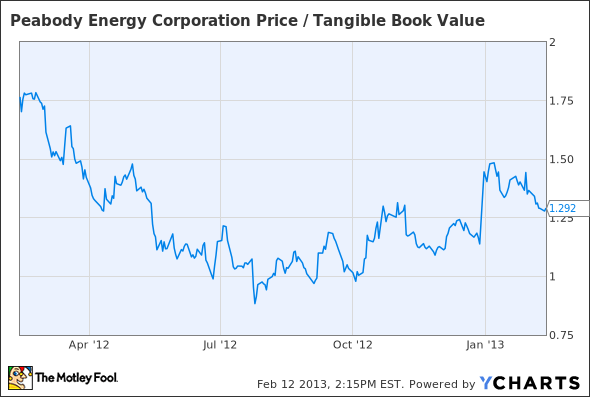 BTU Price / Tangible Book Value data by YCharts. The differences between Peabody and its peers are numerous, but they boil down to two rudimentary factors: management effectiveness and international exposure. Management inefficiency can be a drain on any company, but it is life and death for energy corporations. Selling coal comes down to cost effectiveness, and cheaper always wins. The first and most important metric to measure management effectiveness is gross margins. BTU Gross Profit Margin TTM data by YCharts. Size matters when it comes to extraction, and Peabody takes the cake. Margins have tightened over the past couple years, but Peabody has managed to maintain an impressive lead on its competitors, paving the way for more dollars to hit shareholders' pockets in the years to come. But margins don't mean a thing if no one's buying. U.S. utilities have been starstruck with natural gas prices in recent years, and domestic coal consumption for electricity generation is expected to drop 20 million tons between 2011 and 2016 . U.S. policies on coal are a grey area, sending more mixed messages than a middle school sweetheart. "Clean coal" has been lauded by President Obama as a vital part of America's energy independence, but emissions controls continue to put it on the naughty list. While the domestic outlook is precisely why Arch, Alpha, and James River have been dumped in Mr. Market's garbage bin, Peabody's prospectus looks altogether different. International demand is booming as China, India, and the E.U. continue to increase their coal consumption. 73% of this new demand comes from China alone, where Peabody has established business connections and is the only foreign participant in the country's GreenGen project. China currently generates 80% of its electricity from coal, and increased steel production could continue to drive up coal consumption in the years to come. Peabody's stock has been pushed down by a sectorwide exodus, even as the company's size and global position should put it in bulls' backyard. Looking ahead, coal investors will need to keep an eye on two main issues: natural gas and international policy. Gas prices will dictate the future of coal, and advances in liquefied natural gas (LNG) technology could also put pressure on currently untouched coal exports. Policy decisions in China, India, and other developing countries could further influence the cost effectiveness of coal as these countries consider cracking down on carbon emissions. Coal companies are cheap for a reason, but the fire-sale days may soon be over. Investing in Peabody means investing in a low-risk company in a high-risk sector, a match made in heaven for contrarian growth and value investors.